Get these original works onto your computer, laptop or phone. The Puritans have no doubt profoundly affected me and my walk with Christ. I heartily believe the Church should be educated, and that in today’s technological age, they should have open access to Scripturally sound and Theologically edifying Christian literature from the Reformation and the Puritans. Every Christian, no matter where they live in the world, should not be hindered in their desire to understand the Bible more precisely, and come into a closer walk with Christ – least of all not being able to buy books due to funds. 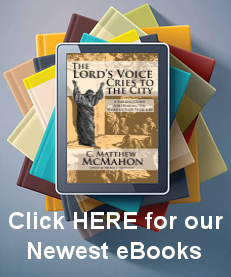 The ministry here at A Puritan’s Mind not only works to disseminate the best Christian literature for free through the site, but with the rise of eBooks in all formats, we endeavor to supply quality Christian literature in accessible formats for free. These eBooks are generally in their original Old English, though many have been updated in some ways. They do not have the quality of the eBook that we publish at Puritan Publications. But they are extremely valuable in their scope and will be a great help to the reader. Most of these eBooks are formatted with an actively linked table of contents. Click on the name of the book to download it. John Hendryx at Monergism.com worked on these eBooks to disseminate them for free because of their exceptional content. The more we are able to get works like these into the hands of God’s people, the more they will be biblically prepared to deal with the world, the flesh and the devil, and to glorify the risen Savior, Jesus Christ. (For those of you who like the Kindle, it would be helpful for you to upload .mobi files to your device with a USB cord to the folder called “documents”…but if you upload eBooks often, you should get the free app from Amazon called “send to Kindle” which will wirelessly upload the file to your Kindle device in an instant. Memoir;Precious Remedies Against Satan’s Devices; Apples of Gold for Young Men and Women; The Mute Christian under the Smarting Rod; A String of Pearls. An Ark for all God’s Noahs; The Privy-Key of Heaven; Heaven on Earth; or, Wellgrounded assurance. The Unsearchable Riches of Christ;A Cabinet of Jewels. The Crown and Glory of Christianity. The Golden Key to Open Hidden Treasures; Paradise Opened; A Word in Season. A sermon on 1 John 2:20. The Nature of True Virtue, Original Sin, Effacacious Grace, Faith. The Common Principles of the Christian Religion, or, A Practical Catechism. The Sinner’s Sanctuary. 40 sermons on Romans 8:1-15. Fellowship with God. 28 sermons on 1 John 1:1-2:3. An Useful Case of Conscience. A Treatise of Christian Love. John 13:35. A Resolution to the Country-man Proving it Utterly Unlawful to Buy or Use Our Yearly Prognostications. A treatise on horoscopes. Economy, or Household-Government: A Short Survey of the Right Manner of Erecting and Ordering a Family, According to the Scriptures. Anthony Burges or Burgess (died 1664) was a Nonconformist English clergyman, a prolific preacher and writer.